Champurrado is a chocolate-based atole, a warm and thick Mexican drink,based on masa(hominy flour), piloncillo,water or milk and occasionally containing cinnamon, anise seed and or vanilla bean.Atole drinks are whipped up using a wooden whisk called a molinillo (or, a blender).The whisk is rolled between the palms of the hands, then moved back and forth in the mixture until it is aerated and frothy.Champurrado is traditionally served with churros in the morning as a simple breakfast or as a late afternoon snack. Champurrado is also very popular during Dia de los Muertos (Day of the Dead) and at Las Posadas (the Christmas Season) where it is served alongside tamales. An instant mix for champurrado is available in Mexican grocery stores. Champurrado may also be made with alcohol. 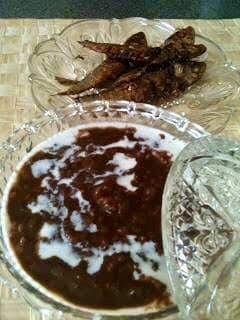 Tsampurado (Spanish: champurrado) is a sweet chocolate rice porridge in Philippine cuisine. 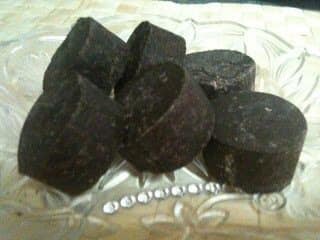 It is traditionally made by boiling sticky rice with cocoa powder, giving it a distinctly brown color and usually with milk and sugar to make it taste sweeter. However, dry tsampurado mixes are prepared by just adding boiling water. It can be served hot or cold and with milk and sugar to taste. It is served usually at breakfast and sometimes together with salty dried fish locally known as tuyo.The pudding becomes very thick and the lighter milk helps to "loosen" it. It's almost like eating "chocolate oatmeal". It can be eaten as a snack or dessert as well. Its history can be traced back from Mexico. During the galleon trade between Mexico and the Philippines, there were Mexican traders who stayed in the Philippines and brought with them the knowledge of making tsampurado (this is also the reason why there is Tuba in Mexico). 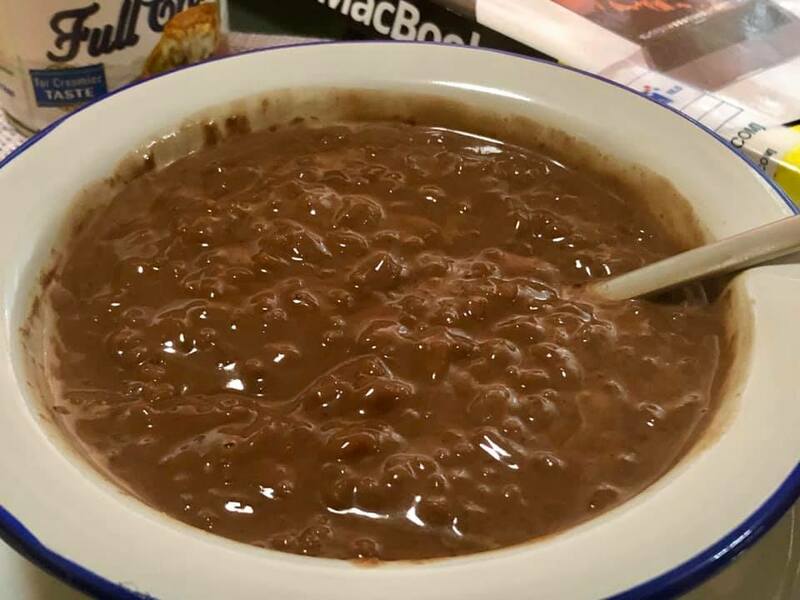 Through the years, the recipe changed; Filipinos eventually found ways to make the Mexican champurrado a Philippine tsampurado by adding rice. As I write my blog, I cant help from smiling cause the history is so amazing. It was a Mexican food handed down to us by the Spaniards and since then we embraced it and adapted to our culture and taste. We wanted simplicity, sweetness and chaos in our palate. Instead of the natural warm, thick drink..it became a porridge to us and to make it absurd.. we love Champorado with our Fried Tuyo or Dried Fish. This tandem is out of this world... chocolatey, milky, sweet and yet eaten with fried, dried kinda salty fish.. I know... I know... dont give me the odd look...its true... and we like it, we enjoy it and in fact Champorado is part of every Filipino's childhood. Becoming a mom, I brought Champorado in my own kitchen but this time with a twist and it has to be dark, richer..not so sweet but with lots of milk and pure cocoa.Yes, we use Tableya... a molded grounded pure cocoa which back in the old days were homemade. Nowadays, we can buy it from the supermarket but there are provinces that make pure cocoa and you can just buy them in a local store..theres not a name nor a tag... these Tablea comes in a white package and wrapped in a transparent plastic... pure simplicity at its best... homemade using hands and molder although I am not sure if they use a modern machine to grind cocoa after drying. One of my co-workers recently went home to her province and coming back she brought some Tableyas for me. 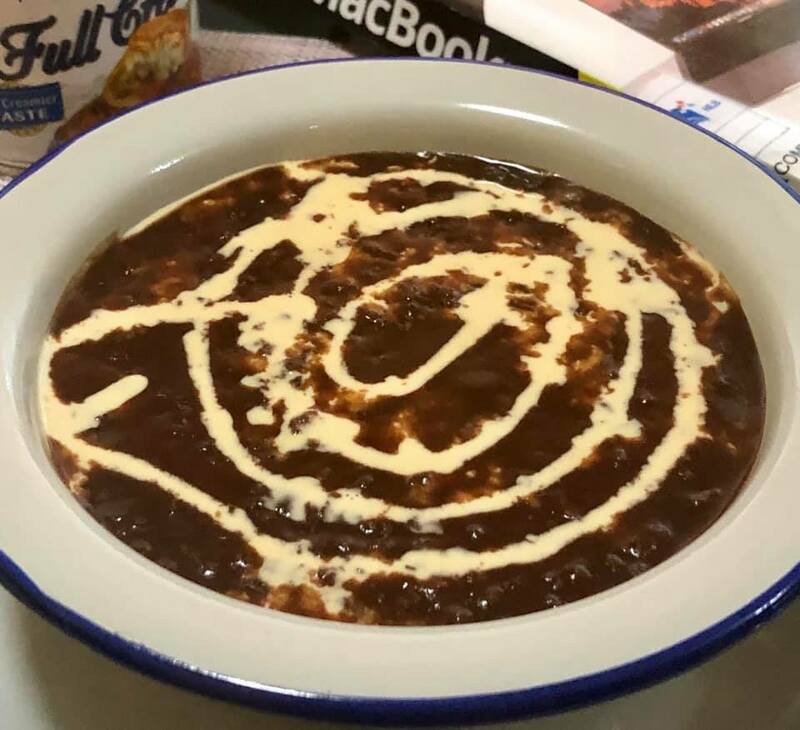 It got me so excited and I ended up writing and cooking our version of Filipino Champorado. 15 cups of water and add 1 cup or two in the end but it depends upon the desired consistency. 6-10 pcs cacao or tablea, use a kitchen knife to cut and turn them into crumbs. You can add them just the way they are cause they melts but I somehow prefer to add them in crumbs because the texture and taste of my champorado is better and creamier. Put glutinous rice in a saucepan, wash and add 15 cups of water. Proceed to cook, let it boil then turn the heat to a medium fire. The technique is to cook the glutinous and let them pop out. Once it has that kind of texture, add the tablea crumbs and sugar. Keep on stirring and dont forget to turn the fire in simmering mode. Stir very often while the mixture is simmering and you will see the mixture is getting thicker. Once you get the desired thickness then you can turn off the fire. Note: A good champorado is thick because milk plays a big part to make a very delicious bowl of champorado. We use evaporated milk to break the thickness...and add more until the desired consistency comes out.. 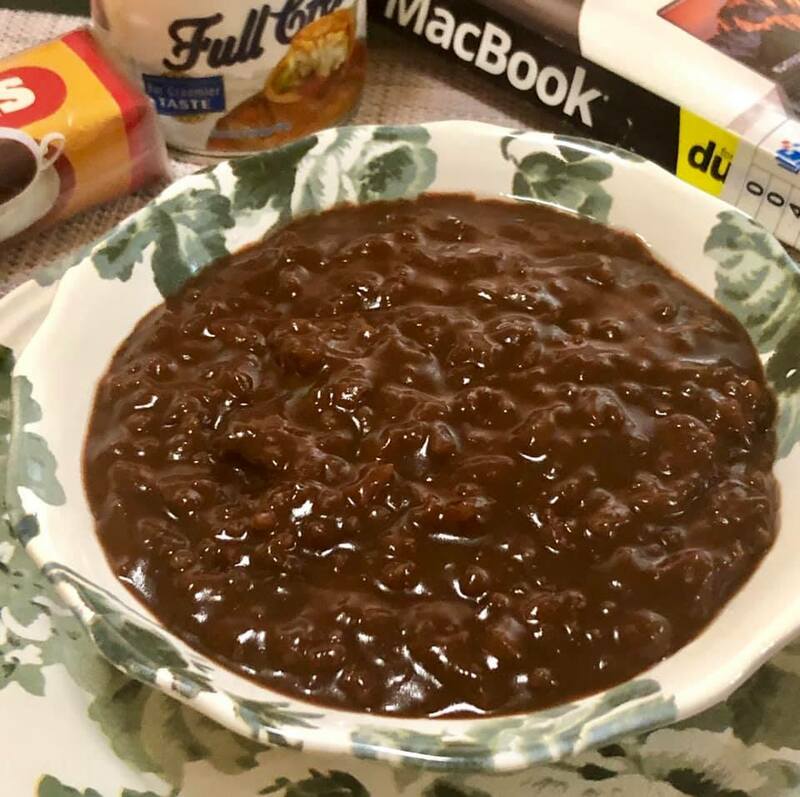 When making Champorado, theres no exact measurement really, it depends upon your taste and how you want it... you just have to use a very good Tablea and dont scrimp..in my case, I always add 10 pcs and the result is gloriously wonderful! Its my desired thickness and I prefer to add 10 pcs of pure Cacao Tablea all the time. My champorado is richer, darker and honestly very delicious..
Filipino Champorado is suppose to be thick...yes, thickened it just the way you like it cause you will make the most powerful combination on earth.. the taste of cacao and milk,..add creamy evaporated milk, the more, the better. Oh yes..its fine..it wont kill you..dont be afraid..I tell you its the most delicious Filipino porridge ever..we want it for breakfast, snack, dessert and even at midnight...yes, my favorite midnight snack...the most comforting Filipino food ever! Dont be surprised, dont be alarmed... it will stir your curiosity...it will make you say...eeeewww, what was that? but keep going, go ahead.. try it. 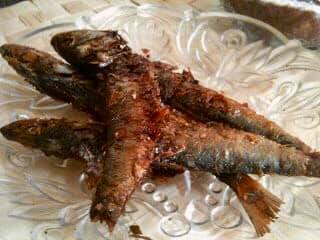 I myself, can not understand why this lowly fried fish is such a good companion for Champorado..
Oh I'm proud of these dark babies, we adapted and in the end we make our own ..very rich in taste and history... its a family, a celebration...lots of memories and a solid foundation of who we are.. we have history... good or bad... dark or light but in the end the goodness is born and reborn. Lets eat, lets giggle and lets be merry ..Happy Eating! Yes, it does make everything brighter.Well, hello chocolate lover! I hope your day is fine. Thanks for coming over. Thank you Angie.Have a great week. I haven't had champorado in such a loooong time. This was the meal I always enjoy with my mom. Thank you for bringing back childhood memories and for sharing at Fiesta Friday party! Hello Jhuls, its about time to enjoy again. Thank you for coming over and for the kind words. Goodness me, this sounds totally bizarre but I love to try new things and this has stirred my curiosity. This will be a very special treat and thanks so much for sharing them with us at Full Plate Thursday. Hope you are having a great week and come back soon! Thank you Miz Helen. I appreciate for coming over with your kind words. Have a great week. This looks delicious! I love anything chocolate, so this is right up my alley. Although I'm not sure about the fried fish... ;) I always love the history you share, too. Thanks so much for linking up at Sweet Inspiration! Hi Amy, I hope you are having a great day. Yes, I understand the hesitancy with dried fish.. ha ha ha. But you can just enjoy champurrado without it.